The beginning of January is usually a busy domestic travel period as Saffas are heading home after the Christmas holidays and others need to get back before the start of the school semester. The short summer school holiday draws to a close on the 9th of January 2019, which means that flight prices will be very expensive during that first week of the new year as schools and most companies re-open at the same time. Private schools only resume on the 16th of January 2018, therefore flight prices are elevated until the 15th of January 2018. Those not restricted by school holidays or leave can enjoy a much more affordable holiday after the 15th of January 2019. Kulula JHB to CPT : Flight prices are elevated at the beginning of the month, when most holiday-makers return to work. Rather travel during the second half of the month on dates highlighted in green. Kulula CPT to JNB : If you are looking for more affordable flights, then try to book flights for travel from the 15th onwards. Kulula Lanseria to CPT : Affordable flights are readily available after the first week of the month. Kulula CPT to Lanseria : Budget conscious travellers should try to book flights from the 13th onward as those are the most affordable flights. Kulula JHB to Durban : Affordable flights are readily available on this route, with the only date to avoid being the 7th. Kulula Durban to JHB : Prices are very affordable and consistent from the 7th onwards. Kulula Lanseria to Durban : If possible, avoid travelling between the 2nd and 6th of January as prices are slightly elevated on those dates. Kulula Durban to Lanseria : Although flights are fairly consistent throughout, avoid travelling on the dates highlighted in pink below if you are on a tight budget. Kulula JHB to George : Weekends are the most affordable time to travel this month on this route. Kulula George to JHB : The difference between the most expensive and cheapest flight is astronomical. Flights are more afforable from the 15th onwards. Kulula CPT to Durban : Tuesday flights, from the 15th onwards, are the most affordable day of the week to travel on. Kulula Durban to CPT : Flights become more affordable from the 8th onwards, but the cheapest flight is available on the 22nd of January 2019. Kulula JHB to East London : Avoid travelling on the 26th as that is the most expensive day to travel on. Kulula East London to JHB : Prices are very consistent throughout the month, with the only date to avoid being the 25th of January. *Prices were pulled from Kulula's website on the 20th of December 2019. The more time has passed since then, the less likely you are to find these prices. All prices are subject to change and availability. Settling back into your routine of traffic, the school run and packed lunches is hard enough without the exhorbitant flight prices eating into your already tight budget. By making use of this guide and being flexible we can turn Janu-worry around! Where possible, avoid travelling during the first week of the month and try to book flights for the beginning of the school holidays as early as possible. As soon as schools resume operations on the 17th of January 2018, things start returning to normal. In general weekday flights are still slightly cheaper than weekend flights on some routes, although 2018 does seem to buck the trend on some routes. As always, try to avoid travelling on dates highlighted in pink where possible as those are the most expensive routes to travel on. Kulula JHB to CPT : Flight prices are elevated at the beginning of the month, when most holiday-makers return to work. Rather travel during the second half of the month. Kulula CPT to JNB : If you are looking for cheap flights, you should plan to travel from the 13th on. Kulula Lanseria to CPT : There are affordable flights available throughout the month. If you are on a tight budget, you should avoid travelling on the dates highlighted in pink. Kulula CPT to Lanseria : Affordable flights are readily available from the 9th and onward. If you are on a tight budget, avoid travelling during the first week of the month. Kulula JHB to Durban : Save money by travelling after the rush and making your way to Durban from the 15th onward. 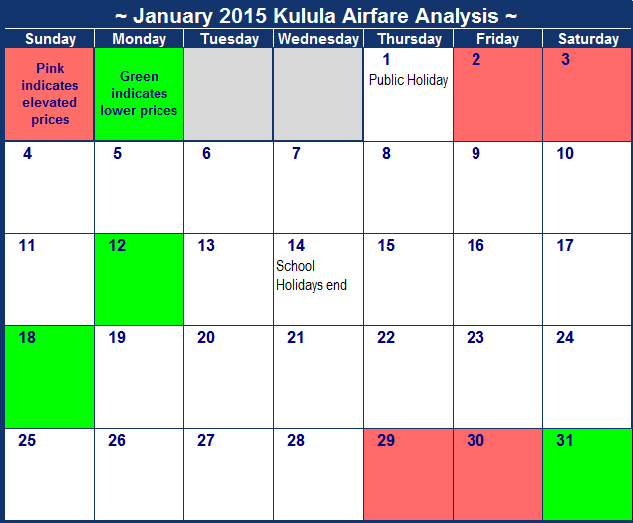 Kulula Durban to JHB : Budget travellers should take note of the dates marked in green. Kulula Lanseria to Durban : Although flights are fairly consistent throughout, avoid travelling on the 13th if possible. Kulula JHB to George : Flights are almost unbelievably consistent throughout the month. Kulula George to JHB : The difference between the most expensive and cheapest flights are astronomical, with the 2nd and 3rd being rediculously expensive. Kulula CPT to Durban : Flights from the 16th are all relatively affordable, but for the cheapest airfare it is best to book a Tuesday or Wednesday flight. Kulula Durban to CPT : Affordable flights are few and far between this month, so look for dates highlighted in green today. Kulula East London to JHB : Try to travel after the first week of the month, especially avoiding the 6th of January. The first two weeks of the New Year are by far the most expensive time to travel as holiday-makers start returning to the office. Not surprisingly the 2nd and 9th, both Mondays, are the most expensive days to travel on during the two week period. After the first two weeks, most have made their way back to their homes to either start working again or prepare for the school year which explains the abrupt drop in flight prices after the 15th on most routes. Travellers on a tight budget would benefit greatly by simply taking leave a little later in order to return a little later in the year. Added bonus? Avoiding the crowds! Whenever you choose to return to your normal schedule this year, we hope you had a productive leave and that you return home safely. Kulula CPT to JNB : If you are looking for cheap flights, you should plan to travel after the 16th. Kulula Lanseria to CPT : The first two weeks are by far the most expensive days to travel on. Kulula CPT to Lanseria : Avoid travelling on the 6th, 7th and 8th where possible as prices are inflated around those dates. Kulula JHB to Durban : Save about a R100 by travelling after the rush and making your way to Durban from the 15th onward. Kulula Durban to JHB : Budget travellers should take note of the 18th, 19th, 21st, 24th, 25th and 31st. Kulula Lanseria to Durban : Although flights are fairly consistent throughout, avoid the 19th where possible. Kulula Durban to Lanseria : The 7th is by far the most expensive date to travel on, although the 2nd and 9th are in close second spots. Kulula JHB to George : Airfares are slightly more expensive during the first two weeks of the New Year, with the 2nd being the most expensive date to travel on. Kulula CPT to Durban : Flights from the 15th to the 30th are all relatively affordable. Avoid flying on the last day of the month and the 3rd and 4th. Kulula Durban to CPT : Travelling after the 18th is advisable when on a budget as fares become more affordable. Kulula JHB to East London : Avoid travelling on the 27th as that is the most expensive day to travel on. Kulula East London to JHB : Save money by travelling after the 15th if possible as fares become more consistently affordable. January is easily one of the busiest travel months in South Africa! Not only is it the school holiday period, but most workplaces also close between Christmas and New Year meaning families are free to travel and visit holiday homes and relatives over the festive period. The pleasant weather also serves as a further incentive for both local and international tourists to explore South Africa. As is evident from the prices below, most people end their holidays and book return flights either within the first three days of the New Year or on the 12th of January 2016, just before the school holidays end. Prices listed below were the cheapest we could find on the 28th of December 2015 for each day in January 2016. The more time that has passed since the survey, the more likely it is that prices might have changed. For current airfares visit Kulula.com. Kulula JHB to CPT : Try to avoid flying around the end of the month as airfares are elevated on the 29th, 30th and 31st. The 11th is a good date to fly back before the school semester begins. Kulula CPT to JNB : Flights just after New Year are the most expensive and if you need to make your way back before school starts then try the 12th and 13th for the cheapest airfares. Kulula Lanseria to CPT : Prices are relatively consistent throughout the month, but it is slightly elevated towards the end of January. 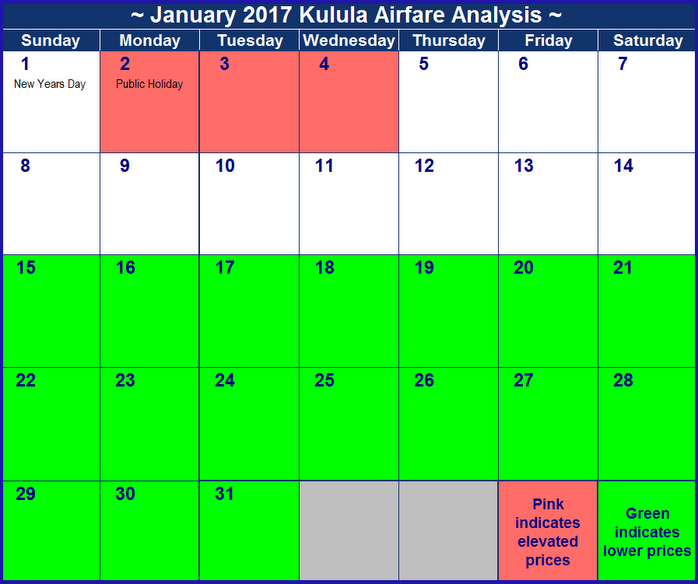 Kulula CPT to Lanseria : Avoid flying in the first week of the new year as prices are seriously elevated on those dates. Kulula JHB to Durban : Prices are elevated on the 16th, 23rd and 30th. The best priced flight by far is at the end of the month. Kulula Durban to JHB : Avoid flying back the week before school starts as those airfares are the highest. Flights on the 31st are by far the cheapest. Kulula Lanseria to Durban : Although flights are consistent throughout, the cheapest are available on the 31st. Kulula Durban to Lanseria : If you have to return before the 14th, the flight on the 13th is the cheapest. Flights deparing on the 8th to the 12th are very expensive. Kulula JHB to George : Airfares are consistent throughout the month and are only slightly elevated the week before the start of the school semester. Kulula George to JHB : Airfares for the first three weeks of the month are slightly elevated compared to the last two weeks. Avoid flying on the 2nd, 3rd, 4th and 5th. Kulula Durban to CPT : Avoid flying on the last two days of the month as prices are elevated on those dates. Rather fly somewhere between the 15th to the 28th. Kulula JHB to East London : Incredibly the airfares for this route are the same for every day of the month. Kulula East London to JHB : Avoid flying on the 26th and rather try any of the surrounding dates for more affordable prices. January is the warmest summer month in South Africa so it is prime time to visit our beautiful coastlines and beaches in Cape Town and Durban. As school holidays only end on the 14th of January 2014 and the 1st of January is a public holiday, prices are elevated between these dates. Prices listed below were the cheapest we could find on the 13th of June 2014 for each day in January 2015. The survey was performed on the 13th of June already and the more time that has passed since this date, the more likely it is that prices might have changed. For current airfares visit Kulula.com.